Step 4. Click the "To Word" button under the Home tab in the PDF Converter toolbar. Wide Angle PDF Converter is a PDF to MS Office converter, but it can also convert PDFs to image formats among other functions. Under the Home tab in the PDF Converter toolbar, you'll see a Quick Convert section. This provides the ability to convert your PDF document to Microsoft Word, Excel and Powerpoint files, and also as a JPG image. 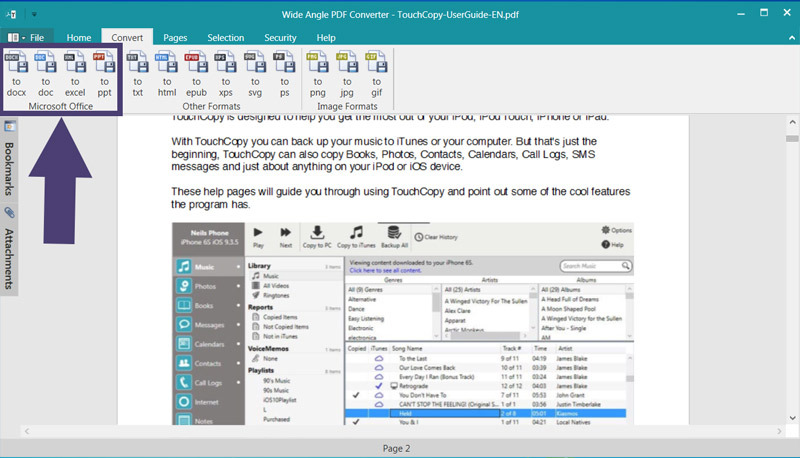 To do this, simply open a PDF in PDF Converter, then click the format you wish to convert to. As well as the option to convert to Microsoft Office Formats in the Home tab, there are additional options under the Convert tab. docx - Microsoft Word Open XML Format Document file (Word 2007+). doc - Microsoft Word document file (pre-2007). Want to convert PDF to JPG or another image format?